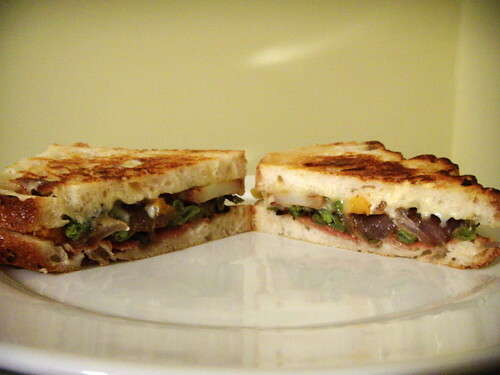 roasted winter vegetable, prosciutto di parma, bom petisco, and gorgonzola pressed sandwich on focaccia, originally uploaded by aarn! +9th January, 2009+. reused some leftover winter vegetables that trisha had roasted. potatoes, butternut squash, green beans, garlic, and red onion, baked for 45-minutes (flipping along the way), in thyme, olive oil, and salt and pepper. put some bom petisco semi-soft cheese on a few slices of iggy's focaccia, with a few rocks of gorgonzola, a slab of prosciutto di parma from savenors market, and pressed with an iron in a lightly buttered frying pan. heavy duty.